Can Ice Cream Cause a Gallbladder Attack? Your gallbladder aids in the digestion of food by releasing stored bile that helps process fats. A gallbladder attack results when gallstones form in the gallbladder and move through the bile duct. Eating foods high in fat, such as ice cream, could bring on an attack, resulting from the inability of the stored bile to travel through the blocked duct. Knowing the signs and foods that may cause symptoms will help you talk to your doctor about your condition and make good dietary choices. You may have gallstones without any symptoms, but if the stones move through the duct, you could experience mild to severe symptoms. These signs include pain in the upper abdomen or to the upper right of this area. This pain could radiate to your back and up to your shoulder blade as well. Other symptoms may include nausea, vomiting, fever and yellowing of your skin and eyes. The brands and flavors of ice cream vary, as do the calorie and fat content. On average, a 1/2-cup serving of vanilla ice cream may contain around 7 grams of fat, and when you consider that most people consume far more ice cream than 1/2 cup, the fat intake may be considerably higher. If you have risk factors for a gallbladder attack, such as previous gallbladder problems or family history, consider other options. Instead of a high-fat ice cream, choose a sorbet made from whole fruits, because this will not contain fat. 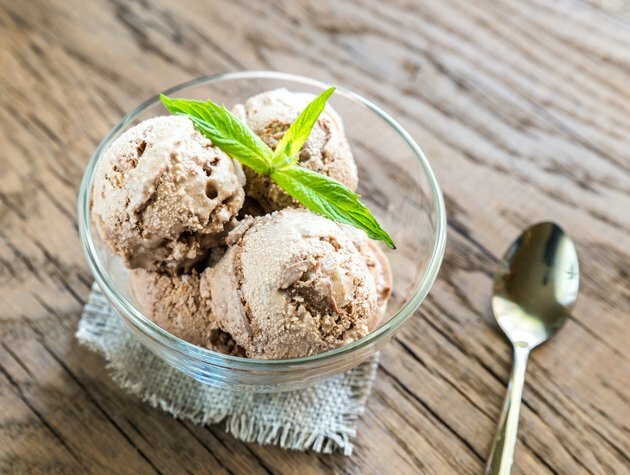 You may also consider a low-fat version of your favorite ice cream, but you will need to watch your serving sizes to make sure you do not eat a large amount and end up consuming a high amount of fat. In addition to ice cream, other high-fat foods may also bring on a gallbladder attack. These foods include fried foods such as french fries and corn dogs. Cheese and dairy products from whole milk contain high amounts of fat, and if you eat chips, cookies and flavored crackers, this may also increase your fat intake. Many processed foods contain a significant amount of fat, so read labels carefully and note the serving size for the product. If you have symptoms of a gallbladder attack, talk to your doctor to determine if you have gallstones or other health conditions. Treatment of gallstones may include a procedure to break up the stones so they will pass through the duct. If you have a more extensive problem causing the stones, your doctor may recommend surgically removing your gallbladder to prevent complications or further discomfort.